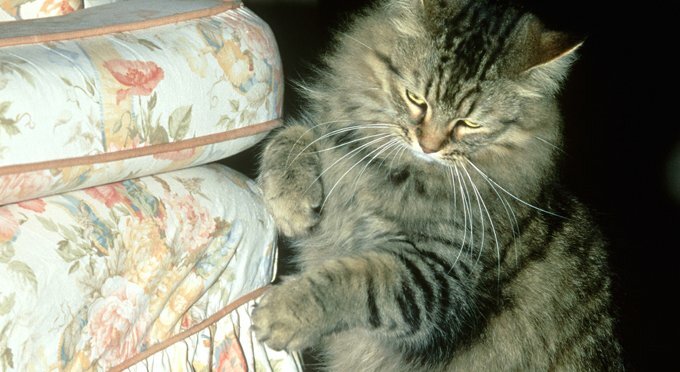 Dear Tabby: Cat Won’t Stop Clawing Furniture! My wife and I just got a cat for our family and everyone loves her. The only problem is that Furball is clawing our dining room chairs into ribbons. We don’t want to have her declawed, but what can we do to make her stop? Please help! You can’t cure cat scratching — it’s instinct and used to mark the animal’s territory. You also certainly don’t want to declaw Furball, and punishing the cat won’t work. What you need to do is redirect your cat to scratch something else — preferably a scratching post. The sooner you start re-educating them the better. Several types of scratching posts are available on the market, but look for something that resembles the shape of what Furball likes to scratch. Place the scratching post next to your dining room chairs, and it wouldn’t hurt to rum a little catnip on the post so she’s attracted to it. Also make sure the scratching post is securely anchored; if it falls over, it could startle her and she may not want to use it again. Also important: Although it could be an eyesore, do not throw a “shredded” scratching post away; cats are proud of their work, and may get upset if you discard it. You can also discourage Furball from scratching the chairs by spraying them with a citrus spray (just make sure it doesn’t stain); you can also use a Stick Up-type air freshener. Placing double-sided tape or tinfoil on the “targeted” structure also helps discourage cats from scratching it. Trimming your cat’s claws is another effective action you can take. You can do this procedure yourself (with the help of another family member), or your veterinarian can do it. Another alternative is to cap your cat’s claws with a product such as Soft Paws to keep your furniture safe. Like clipping claws you can do it yourself or have it done at your vet’s office.